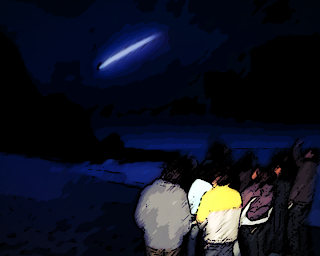 Inexplicata-The Journal of Hispanic Ufology: Argentina's Gualeguaychú UFO: An IFO? Argentina's Gualeguaychú UFO an IFO? In recent weeks, videos of a "UFO" recorded over Gualeguaychú have been broadcast over the local and national media, showing a celestial object that has attracted the attention of locals. Phenomena of this sort occur on a daily basis and through this article submitted to AIM, specialists of the Asociacion Entrerriana Astronomica de Entre Rios (Entre Rios Astronomical Association - AEA) have tried to explain certain characteristics to enable identification. For over 60 years, humankind has had a presence in space through its machines, highly technical devices that go around the Earth time and again in all manner of orbits. Some of these objects, due to their orbital characteristics, altitude, eccentricity, etc. are visible at certain moments of the day. They do not generate their own light, but rather, reflect the light of the sun. The most famous of these are the International Space Station and the Iridium satellites. The ISS (International Space Station) is an object measuring over 100 meters long that orbits our planet at 27,600 kilometers an hour at an altitude of 431 kilometers. It has roughly the same size as a soccer pitch. It orbits our planet since 1988 and has a permanent population of 6 astronauts that rotates every six months, approximately. This monumental object is visible to the unaided eye shortly after sunset (for a few hours) or shortly before sunrise (for a few hours). Being a large object, it reflects the sun in the summertime, it is very bright, and given its speed and continuous light (it does not blink like aircraft), it is often cataloged as a UFO. Video enthusiasts often show it with color variations, ranging from red to blue and passing through yellow. This is due to the optical properties of cameras, particularly cell phones. Furthermore, when photos are taken, improvised means are used to steady the photo device, using hands, and with the consequent motion. To illustrate this, we provide a video taken by a member of the AEA and involving an ISS sighting. As for Iridium satellites, the situation is even more striking. In many opportunities, these satellites seem to appear and disappear "in an instant". This is known as a flare. If it is recorded, you will see a light that appears and disappears, provide that the satellite's path isn't fully visible. In this case, the satellite's entire trajectory will be visible, with an increase of brightness, followed by a dimming or disappearance. one of these antennas reflects sunlight directly back to Earth, creating a bright "fake star" for a few seconds. The phenomenon has an approximate magnitude of -8 (rarely reaching -9.5). Some flares are so bright they can even be seen by daylight, but are more impressive at night. These light flashes can sometimes be a nuisance to astronomers, as they disturb observations and can even damage sensitive equipment. The night of the Gualeguaychú UFO (unidentified flying object, not to be confused with "alien spaceship") was a very active one in the skies over Entre Rios. Within a span of 3 hours, from 21:00, it was possible to see the ISS, two visible transits of the Hubble Space Telescope (HST) and two Iridium satellite flashes. One of them, Iridium satellite 75, was particularly flashy, as it executed its entire trajectory with a -3.9 magnitude and with a -6.2 magnitude flare. Both magnitudes are very bright and stand out in the sky. As if this wasn't enough, the satellite appeared to "vanish" in an instant, due to the fact that the sun ceased to light it (none of these objects is self-luminous). Was the object seen over Gualeguaychú one of these? Maybe, although confirmation would require other information that would make this hypothesis a certainty.